Salem, MA – Born in Santander, Spain, Jesus Nebot came to America in 1996 to expand his acting career. Fifteen years later, the 47-year-old has acted, written and directed on a variety of projects, and now is using his success in the entertainment industry to raise awareness about issues such as immigration. “I am committed to films that have something to say, to socially relevant films,” he said. 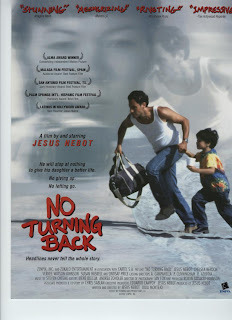 On Thursday, September 29th, Nebot will visit Salem State University (SSU) to present his 2001 film, “No Turning Back.” Inspired by actual events, the film’s story follows a Honduran man who enters the U.S. illegally and goes on the run. The film—which Nebot wrote, directed and stars in—will begin at 6 p.m. in Veterans Hall at the SSU Ellison Campus Center and will be followed by a short lecture and a question and answer session with the audience. Last year the Hispanic American Society at Salem State organized an immigration lecture during National Hispanic Heritage Month, which runs from September 15th to October 15th. This year the group decided to do something different and contacted Nebot. “I thought this would be a more interesting way to introduce dialogue about immigration,” said Rebecca Jimenez, 34, the associate director of the Campus Center at Salem State. Observation of National Hispanic Heritage Month first became public law on August 17th, 1988, under President Ronald Reagan as a tribute “to the generations of Hispanic Americans who have positively influenced and enriched our nation and society,” according to the Library of Congress’ website, hispanicheritagemonth.gov. In support of this month, Nebot is currently on tour visiting colleges and universities in twelve different states, screening his film and sharing what he calls “a humanitarian perspective” on immigration. Nebot is also hoping to generate interest and raise awareness among university students. “We need greater understanding of all points of view,” he said. Of the approximately 6,000 students at SSU, 20 percent are “self-reported students of color.” In 2010 the U.S. Census Bureau reported that 9.6 percent of the Massachusetts population is of Hispanic or Latino origin. “For a lot of students, probably their parents are immigrants working here so it’s hard,” said Brenes, 22, student president of the Hispanic American Society at the Salem campus. If You Go: “No Turning Back,” Thursday, September 29 at 6 p.m. Veterans Hall at the SSU Ellison Campus Center, 352 Lafayette Street, Salem, MA. Although we were holding speedy to be able to leading their particular newest improvements together with breitling replica watches a lot more successful kinds, we were holding furthermore ignorant during the time in which jointly that they had nearly all of chanel outlet the particular problem parts which will in the end make-up the present day diver's observe. Why don't we uncover the move to see what precisely generated the particular jump observe, even as realize that nowadays. Often, snorkeling timepieces suggest the particular best regarding modern day watchmaking. We all observed timepieces getting used around the Silent celestial body, go beyond the particular velocity regarding appear, yet chanel outlet conquering the particular tremendous strain in which prevails simply on the biggest items fake omega sale individuals world can be a very different concern entirely. That is finest verified from the means of just how timepieces sneaked out of our own vest storage compartments fake rado sale and also on our own wrists, to be able to in the end grow to be tools able to executing inside tens or perhaps thousands specific armed service activities and also technological dives likewise, withstanding really strenuous ailments. Nice Work !! Really a touching story with good Inspiration to out mind ! A local of Chicago, Bryan Anderson enrolled in the Army in April 2001 and had a "boat out" date of September 11, 2001. He served two voyages through obligation in Iraq and was positioned in the Baghdad region. He accomplished the rank of sergeant in the military police and was recompensed a Purple Heart. Bryan is a vigorous and eager person who appreciates testing his cutoff points. A characteristic competitor, he snowboards, wakeboards, white water–rafts, and rock moves, among different games. In 2006 he took part in the National Veterans Wheelchair Games and won gold decorations in bows and arrows and table tennis. Bryan is the national representative for Quantum Rehab, a division of Pride Performance Mobility, and USA Care. For get more details please consider the custom thesis writing service provider from online. The environment here is not very open and i think many of them live underground the filmmaker nebot who, as a teenager worked as an undocumented worker in france has a similar view you approach immigration from a very narrow perspective thinking only legal or illegal you are all procreators of the issues behind immigration.Thanks for sharing information. Thank you for sharing the film, wanna check it out.